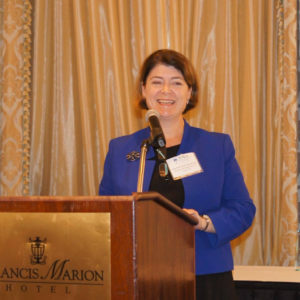 Maureen Kelly Moseman was honored with The AALA Distinguished Service Award, which is given annually to an AALA member for contributions to the organization and to agricultural law. 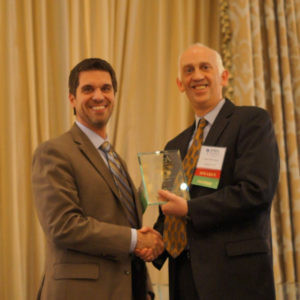 The award recipient, chosen by the three most recent award winners, is selected based upon consistent demonstration of dedication to furthering the development of agricultural law, strengthening the legal profession, increasing the size and influence of AALA, and fulfilling the law-related information needs of lawyers and citizens alike. In recognizing Moseman as the Distinguished Service Award winner, AALA President Jesse Richardson noted that her entire career has been one of service and dedication to agriculture and agricultural law. Moseman has taught hundreds of students as an adjunct professor at the University of Nebraska College of Law. She has been a distinguished visiting lecturer at the University of Nebraska Medical Center, University of Arkansas and University of St. Thomas. During four years of service in the United States Department of Agriculture, Moseman served as Special Assistant to the Under Secretary for Food Safety; Special Assistant to the Administrator of the Cooperative Research, Education and Extension Service; Legislative Director for the Under Secretary for Research, Education and Economics; and as Chief of Staff to the Under Secretary for Marketing and Regulatory Programs. She began her career in Washington, D.C. as legislative assistant and counsel to Congressman Earl Pomeroy of North Dakota. While Moseman has been a committed volunteer to AALA, serving as President from 2008-2009, her greatest service was as interim executive director from May 2014 until March 2015. In that role, she led a transition to modernize the financial records and membership database of the association. Moseman successfully managed the annual meeting and legal education conference attended by over 250 members and which featured dozens of speakers. Moseman also designed and guided a human resources strategy for the association to recruit, hire and train a permanent executive director. She has continued to provide leadership to the board and the executive director on how to provide services of value to the AALA members. Moseman is currently president and owner of Moseman & Associates, LLC, a full service government relations firm which provides expertise to nonprofits, universities and agribusinesses on federal legislative and regulatory issues. The purpose of the AALA’s Excellence in Agricultural Law Award is to recognizeAALA members for outstanding contributions to the legal profession and the agricultural community. These awards may acknowledge members from professional sectors, including private practice, academia, government and non-governmental organizations (NGOs) . This year, AALA honored Tom Carrato for his contributions as a private practitioner, Ted Feitshans for his academic work, and Justin Schneider for his non-governmental organization dedication. Tom Carrato is an attorney and the principal of Creative Biotech Solutions, LLC, an agricultural technologies consulting firm established in 2013. His previous employment included over twenty years with Monsanto. With over 25 years’ experience working to achieve critical policy objectives on behalf of industry, Carroto has become a globally recognized expert in strategic regulatory policy issues related to seed trait technologies. Carroto has also received recognition in 2012 from the international biotechnology industry with CropLife International’s first Lifetime Achievement Award for Excellence in Plant Biotechnology. His nominator highlighted many accomplishments of Carroto, including his role in setting guidelines for stewarding the introduction of new ag biotech products and orchestrating the industry agreement on post-patent access to ag biotech transgenic events and regulatory data. His work as the primary author of the biotech seed industry’s “Compact” received a standing ovation at a meeting in Cartagena, Colombia of over 180 nations. The Compact provides for redress through voluntary arbitration with governments in the event that a biotech crop is proven to cause harm to biological diversity. Each of these award winners continues to contribute to excellence in our profession. 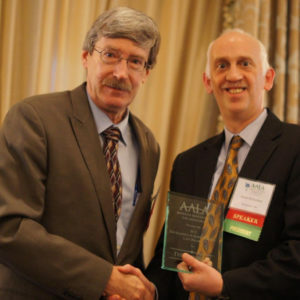 Each year, our organization also presents AALA Scholarship Awards which are intended to recognize and encourage scholarly work. In selecting student and professional winners, the AALA Awards Committee considers criteria including the excellence in quality of writing, the relevance to important legal issues in agriculture, broadly defined, the clarity of analysis, the potential impact, and other attributes of scholarship. In 2015, our Student Scholarship Award Winners were Jacob Strobel and Kyndra Lundquist and our Professional Scholarship Award recognized the article by Nina Federoff and Drew Kershen for the articles cited below. Jacob Strobel, a 2015 graduate of Drake Law School, was honored by AALA for his articleAgriculture Precision Farming: Who Owns the Property of Information? Is it the Farmer, the Company who Helps Consult the Farmer on How to Use the Information Best, or the Mechanical Company who Built The Technology Itself?, 19 Drake J. Agric. L. 239 (2014). The awards committee recognized the time and research that went into Strobel’s timely and informative article discussing precision farming and the data that goes into those systems. The article analyzed the privacy rights of farmers who engage in precision agriculture by making a detailed review of the history and information related to ownership of data and the privacy issues that are more frequently becoming a topic of conversation. Strobel concluded the article with his suggested fix for the issues surrounding data use and privacy rights. Strobel’s goal is to use his family farming background and his focus on ag law to work in a rural practice. Kyndra Lundquist, a 2015 graduate of the University of Iowa College of Law, was honored for her work titled Unapproved Genetically Modified Corn: It’s What’s For Dinner, 100 Iowa L.Rev. 825 (2015). The awards committee recognized her well-researched and thoughtful analysis of the issue of escapes of GMO products that are in the testing phase. Her conclusion is that a change in regulation of field trials is warranted to place the costs of preventing escapes of traits on the growers of those traits rather than the farmers who are impacted when the appearance of unapproved traits impact agricultural markets across the globe. Lundquist received her undergraduate degree from Iowa State University. She is currently serving as a law clerk to Justice Edward Mansfield on the Iowa Supreme Court. The Professional Award recognized the work of Nina V. Fedoroff & Drew L. Kershen for their work titled Agricultural Biotechnology—An Opportunity to Feed a World of Ten Billion, 118 Penn. St. L. Rev. 859 (2015). This article looks at how the expanding human population presents need to increase agricultural productivity quickly and to do so without unduly damaging the many other kinds of organisms that share our planet. As advances of genetic engineering and genetic modification hold the promise of making it possible for us to grow more food more sustainably, these advances have evoked an almost unprecedented level of societal controversy quite specifically in the realm of food production, resulting in the proliferation of regulatory and legal issues. To read this article in full, please use the link below. Professor Drew Kershen is Professor Emeritus at the University of Oklahoma College of Law where he teaches courses on agricultural law, legal history, professional responsibility and water rights. In recent years, Professor Kershen has focused his teaching, research and lecturing on agricultural biotechnology law and policy. Dr. Nina Fedoroff serves as Senior Science Advisor at Olsson Frank Weeda Terman Matz, PC in Washington DC, advising on science and policy issues for agricultural plants animals and microorganisms. Dr. Fedoroff’s primary scientific expertise is in plant genetics and molecular biology and she has served as Staff Scientist of the Carnegie Institution for Science and in academic posts at the Johns Hopkins University, Penn State University, and the King Abdullah University of Science and Technology (KAUST).